By bookings only – Angelo’s Food Forest is a living example of the principles of permaculture gardening. See how a conventional backyard has been transformed into a thriving, productive biodiverse demonstration Permaculture food forest with over 30 fruit trees, dozens of berries, unusual medicinal herbs, native bush food plants, hydroponic systems as well as plenty of exotic edibles from around the world too. How to create a suburban Food Forest. 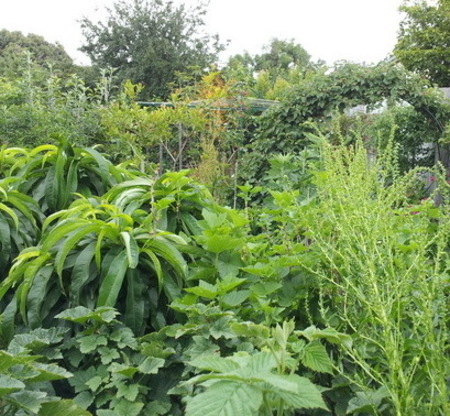 Angelo’s Food Forest is a living example of the principles of permaculture gardening. See how a conventional backyard has been transformed into a thriving, productive biodiverse demonstration Permaculture food forest garden with over 30 fruit trees, dozens of berries, unusual medicinal herbs, native bush food plants, hydroponic systems as well as plenty of exotic edibles from around the world too. Angelo Eliades from Deep Green Permaculture is a presenter, trainer and writer in the areas of sustainable gardening and Permaculture. He is a passionate forest gardening advocate, and his garden won the Darebin Sustainability Award – House & Garden category in 2013, and was featured in the prestigious Open Gardens Australia event in 2014 and 2015. Sustainable aspects: Composting, Organic Vegies, Fruit Trees, Espaliered trees, Berries, Sub-Tropical Food Plants, Permeable Surfaces, Flora for Attracting Fauna, Worm Farms, Wicking Beds, Rainwater Tanks, Pest Control Management techniques. This entry was posted in Upcoming Events and tagged Angelo's Food Forest, Angelo's Garden, garden tour, Permaculture, SGA Sustainable Open Gardens and Tours, workshop. Bookmark the permalink. HI Angelo: Look like Charlie Si is organizing a Biochar workshop down there in Feb or April. Would be a good time to connect with you, include your network in the workshop announcements. Hi Paul, would be great to attend your Biochar workshop and meet up, will be delighted to promote the event on this site! If you want to see an awesome example of a permaculture garden, micro climates and just how much you can achieve in a tiny suburban back yard then PLEASE visit Angelo’s garden. I went last year and can’t begin to tell you how blown my mind was and still is over everything he has squeezed in to his garden.